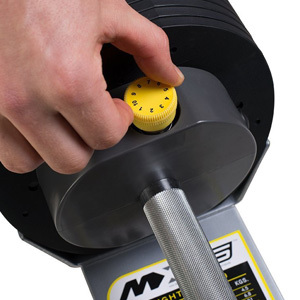 The MX55 are adjustable, selectorized dumbbells made by MX SELECT. They’re similar to the Bowflex SelectTech 552 or the Universal PowerPak 445, however, they have a different adjustment system. They’re excellent free weights, and due to the 10 adjustment settings, they allow you to quickly change the weight of each dumbbell, in order to perform a variety of exercises. When it comes to selectorized dumbbells, one of the most important aspects is the construction of each weight plate and the locking elements that attach the plates together. For the MX SELECT MX55, the weight plates have a metallic core, but they’re encased in an ABS, heavy- duty plastic shell. This plastic shell is necessary for its slots that serve for the connection of the plates. However, even though it’s a durable material, it’s still not as tough as metal. So, as a small conclusion here, these dumbbells are not made for gym use and excessive abuse. Although they are really durable, they’re not to be smashed together during the workout, and you must avoid dropping them on the floor. Even though the weight plates connect together when picked up by the handles, their main support is the handle, which passes through their holes in the middle. Therefore, even if one of the plates sustains damage, it won’t fall off as it will remain on the handle. The ends of the handles extend and retract as you select a certain weight on each end. As each shaft of the handle extends, it will pick up the selected number of plates; each plate will connect to the one next to it via a double interlocking system. Also, each shaft has a safety locking mechanism which prevents it to retract. Now, given the adjustment system and locking mechanisms of the plates and shafts, it’s recommended to adjust, lock, and unlock the dumbbells several times before you start using them, in order to get yourself familiarized with all the steps and to make sure you always lock the plates before commencing the exercise. The handles themselves feature a classic, knurled surface. This design delivers superior adherence; however, it may be a bit abrasive especially for beginners, so in this case, the use of workout gloves is recommended. The handle is cylindrical. It’s approx. 1″ in diameter. Also, in case you’re wondering, the inner length of the handle, in other words, the main grip of each dumbbell is approx. 5″ (13.2 cm). In terms of dimensions, each dumbbell is approx. 16″ (40.5 cm) long with all the plates attached, and approx. 8.5″ (21.5 cm) wide. All plates have equal dimensions and weight. This being said, the MX55 adjustable dumbbells are slightly larger than classic adjustable dumbbells, such as the Yes4All set, which are 16″ (40.5 cm) long, but only 6.5″ (16.5 cm) wide. Their size shouldn’t be a problem, though. Several users between 5’0″ and 5’4″ have reported that they were able to perform any exercise without any hindrance. 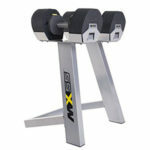 The MX SELECT dumbbell set MX55 comes with a metallic stand, which requires assembly. The tools required for its assembly are included, and the manual provides all the tips requires. This task shouldn’t take more than 10 min. When fully assembled, the stand is 18.7″ (48 cm) long, and 22″ (56 cm) wide. Evidently, it takes much less space than a rack for standard, non-selectorized dumbbells. 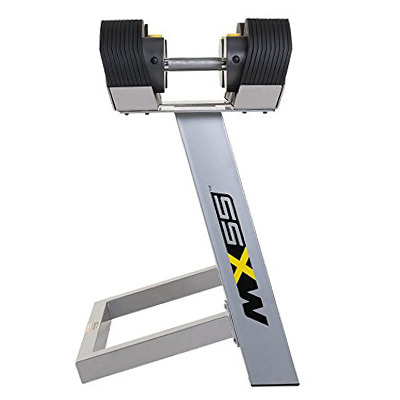 The stand’s trays are specifically designed for MX55 SELECT weight plates and the dumbbells should only be adjusted while placed on these trays, as they provide the perfectly aligned position for the plates. With the dumbbells placed in the trays, the highest point of the whole setting is 30.6″ (78 cm), which is quite a convenient height. It gives you the possibility to easily pick them up, place them back, or adjust them. Each tray features a weight increment table at the bottom which allows you to see at a glance, the total weight of each dumbbell for each setting. 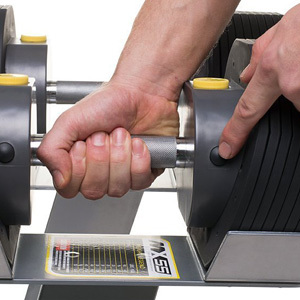 As the name of the product suggests, the MX55 adjustable dumbbells weigh 55 lbs each when all the plates are attached. Each plate weighs 2.5 lbs (1.13 kg), and each handle weighs 5 lbs (2.26 kg). Each dumbbell has 20 plates, 10 for each side. Therefore, on the 1st adjustment setting, the weight of each dumbbell will be 10 lbs (4.5 kg). 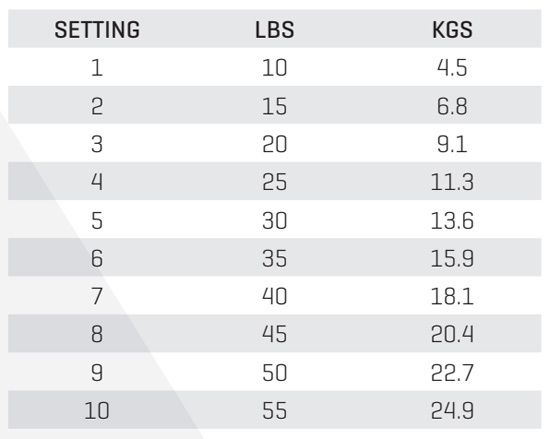 The table below shows the weight specific to each setting. Adjusting each dumbbell is done with ease. On each side, it has a yellow selector with the level increments marked on it from 1 to 10. In other words, if you select level 4, that particular side of the dumbbell will pick up 4 weight plates. The selectors are independent. This is quite a plus as you can select an off-set weight for each dumbbell if you want to work out this way. For example, you can select 5 on one side, and 10 on the other. This way, the handle will pick up 5 plates on one side and all 10 on the other. So, these being said, the minimum adjustment increment for each dumbbell is 2.5 lbs. But it’s recommended to have an equal weight on each side, so in that case, you’ll have weight adjustment increments of 5 lbs. Dropping them or throwing them may cause the ABS casing on the plates to break; they’re not made for excessive abuse, as classic or non-selectorized, metallic dumbbells. 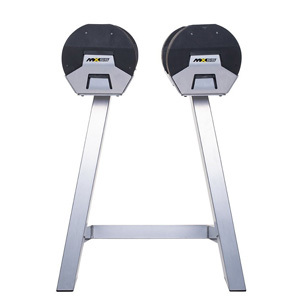 The MX SELECT MX55 are adjustable, selectorized dumbbells with a weight range of 10-55 lbs. They’re great free weights for home use due to their space-saving design and high versatility. They’re perfect for training regimens such as P90X as they allow you to quickly swap between weight increments. They have a professional design, which can be quite a motivation factor. They cover the full range of exercises that can be performed with dumbbells. Even though they may not be the perfect choice for advanced users, who may want a more challenging weight range, they’re simply great for just about anyone who wants to lift weights at home. And finally, even though they’re not the most affordable dumbbells that you can find out there, considering that they basically cover a full set of non-adjustable dumbbells, they offer great value for the price.